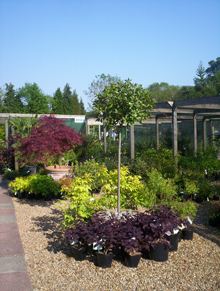 We have an extensive range of trees available in sizes starting from a 10litre pot. 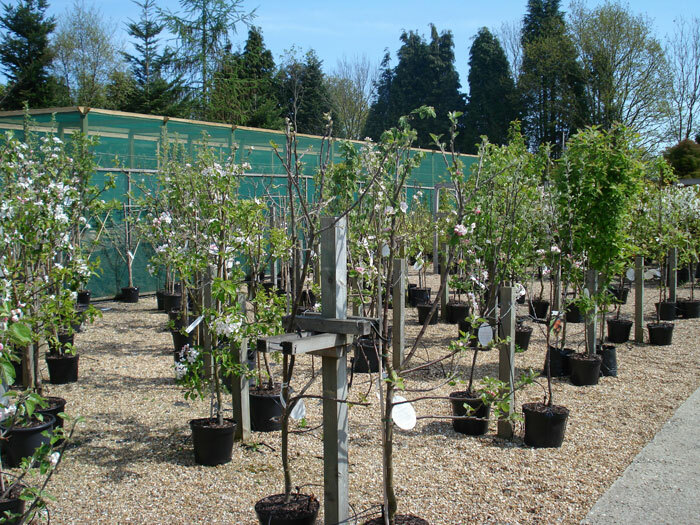 Some of our more popular trees are also available in larger sizes: 37l up to 110l e.g. Betula jaquemontii . Liquidamber Worplesdon. Specific genera of trees generally available include the following, Acacia, Acer, Aesculus, Amalanchier, Arbutus, Betula, Carpinus, Castanea, Catalpa, Cercis, Cercidophyllum, Cornus, Cotoneaster, Crataegus, Cytissus, Davidia, Eleagnus, Eucalyptus, Exchorda, Fagus, Fraxinus, Ginko, Gleditsia, Ilex, Juglans, Laburnum, Liquidamber, Liriodendron, Malus, Metasequoia, Morus, Parrotia, Photinia, Populas, Prunus, Pyrus, Quercus, robinia, Salix, Sophora, Sorbus, Tillia. Where possible our stock of trees is sourced locally so please contact us to check on availability. 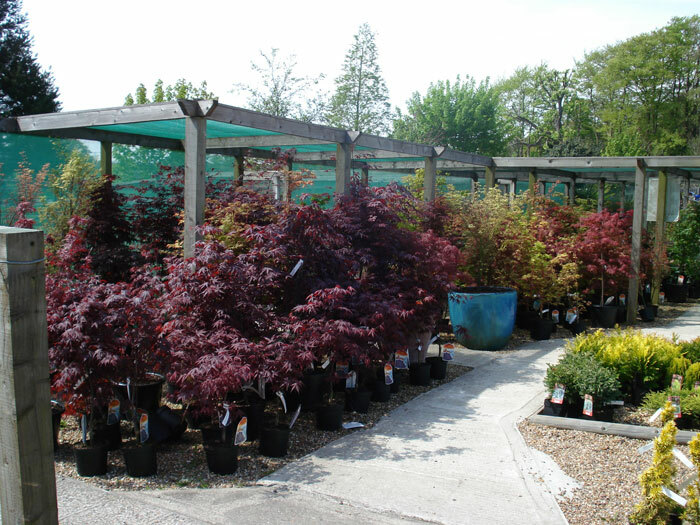 Our Japanese Maples start in a 3litre pot going up to 37litre coming in many different forms. We grow a considerable amount of fruit trees on the nursery. Nearly all varieties are grown on a dwarf stock making them 3-4m overall and suitable for most gardens. We stock, apples, cherries, figs, olives, plums quinces, vines and even medlars. 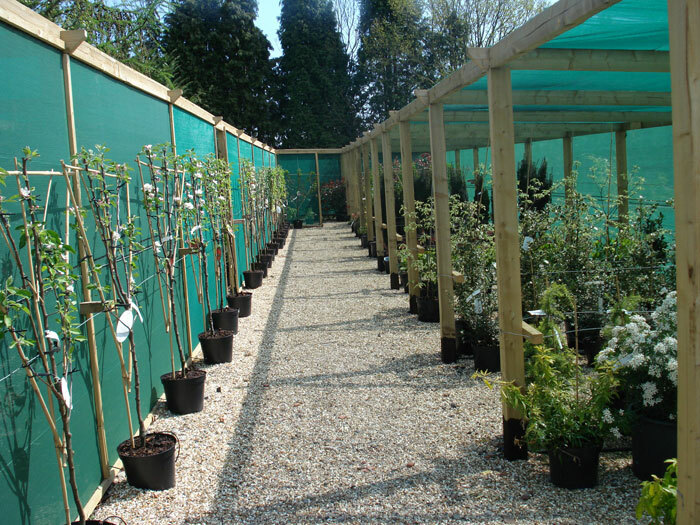 We also have a selection of young trees that have been fan trained. 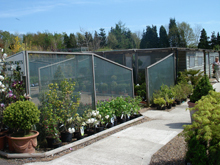 Also available are a selection of gooseberry, raspberry and currant bushes. 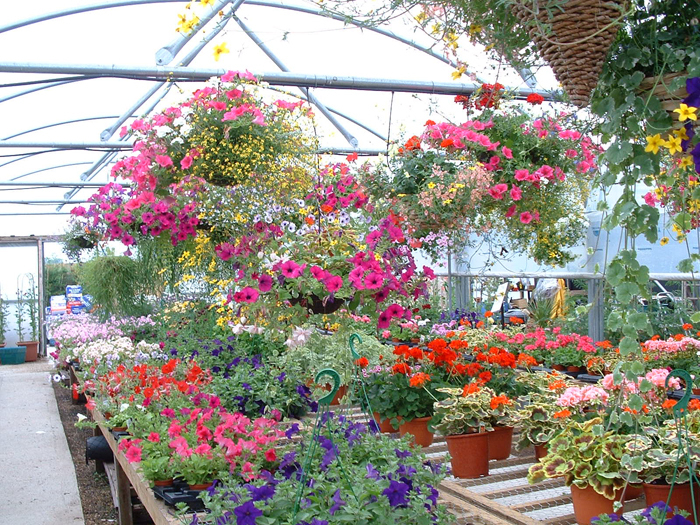 These are grown in pots which make them easy to plant at any time of the year. 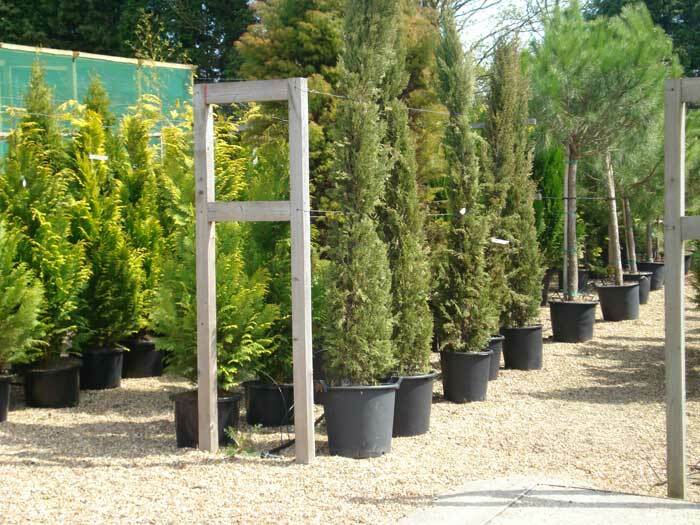 In our conifer section we once again have a range of varieties starting from 2litre with prostrate (low growing, spreading varieties) as well as tall narrow varieties. We also grow several forms as specimen trees up to 50litre pots in some cases. The most popular ranges of hedging i.e. Leylandii, Laurel, Photinia Red Robin etc., we try to carry a variety of sizes most of the year. Please phone or e-mail for availability on size and variety. 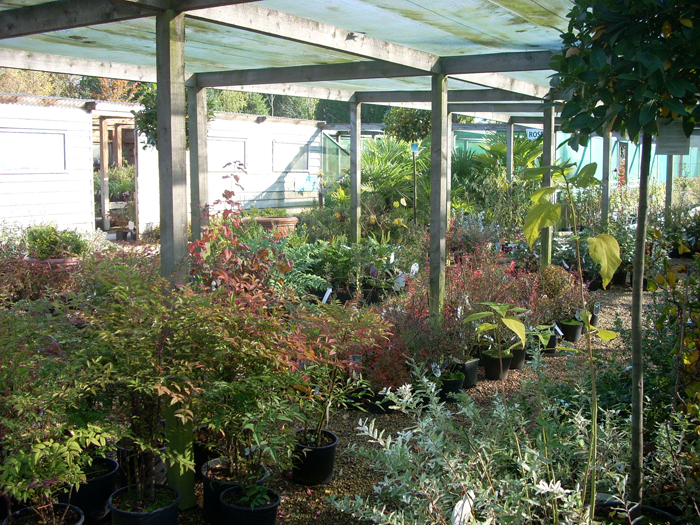 During the Autumn we also carry a range of bare root hedging. 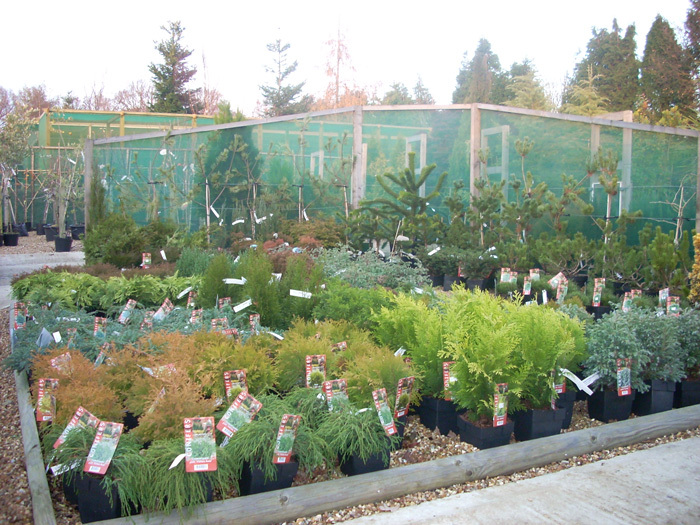 We offer an extensive range of evergreen and deciduous shrubs starting in a 2litre size pot. There are too many species to list here but please phone or e-mail with any enquiries. A selection of David Austen roses are grown under licence on our nursery along with a few other select varieties. We have shrub, floribunda, hybrids, climbers and groundcover varieties. A large percentage of our herbaceous perennials are grown locally and although we veer towards the smaller plants we do have a very large selection readily available to us. 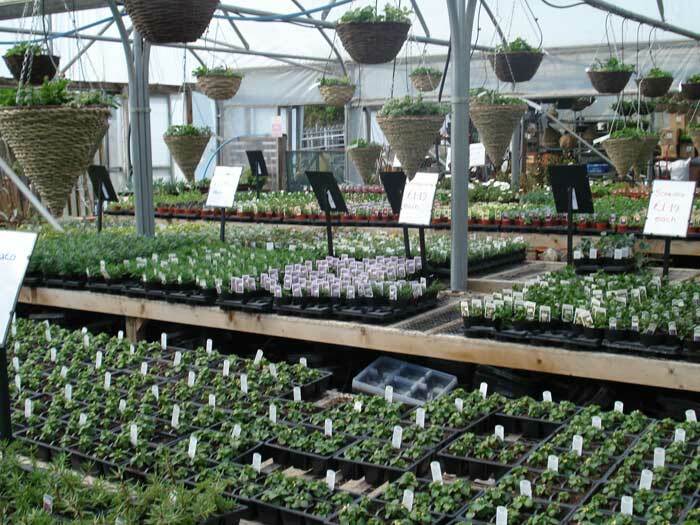 Seasonal bedding is grown by us on site with the emphasis on variety and colour. We make a range of hanging baskets to suit all tastes. Orders can be placed from April onwards. 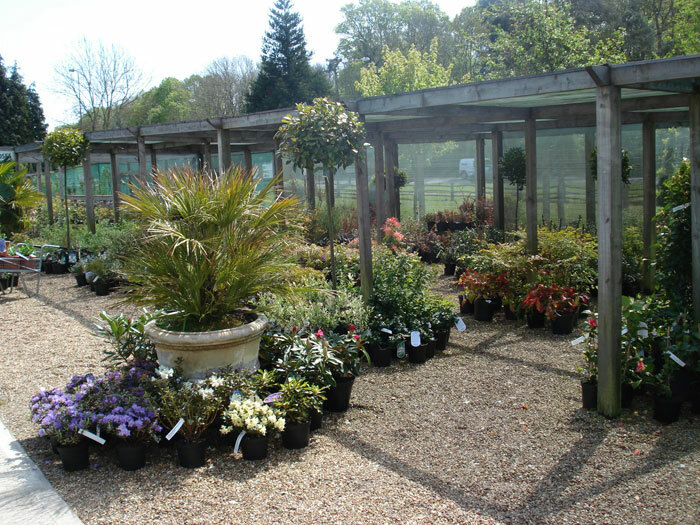 Due to the diversity and nature of our nursery our stock is constantly changing therefore we do not consider it practical to sell our products via e-mail or phone. However enquiries are more than welcome.